The Donutosaurs are fabulous creatures living in the Sweet Kingdom. This little donutosaur woke up in the morning, yawned and... saw with terror that there were no more tasty donuts – his favorite food. Without thinking a lot, he started his long and difficult way in search of his favorite dainty. Despite of the fact that the Donutosaurs look a little bit scary, they are actually very cute and kind creatures. They eat nothing but sweet donuts. They can't imagine their life without donuts – and this little Donutosaur is not an exception. 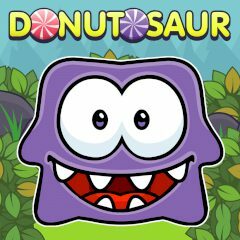 In this free arcade online game you must help this little Donutosaur to eat to satiety in each of the levels. Are you ready to use your wits in order that the Donutosaur was well-fed and satisfied with his life? Welcome to this wonderful game brought to you by MyPlayYard!